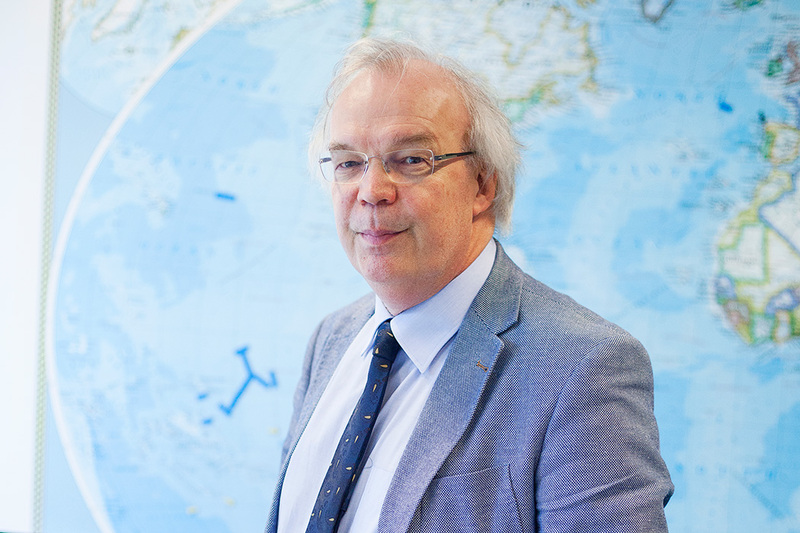 Prof. dr. Dirk van Delft (1951) is director of Museum Boerhaave and special professor of the History of Natural Sciences at the University of Leiden. After studying physics at Leiden University he taught physics at College Leeuwenhorst in Noordwijkerhout. 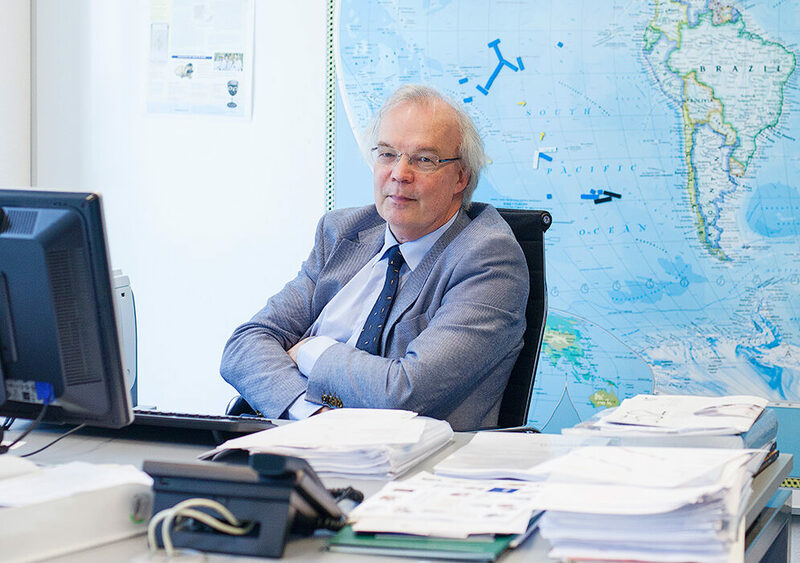 In 1992 he joined the NRC Handelsblad (a highly respected Dutch broadsheet) where he was the chief Science Editor from 1994 until 2005. In 2005 he received his PhD from the University of Leiden with a thesis entitled “Heike Kamerlingh Onnes. A Biography.” In the same year he won the prestigious NWO Eureka Prize for Science Communication. In a cheerful, absurd photomontage by Yves Klein from 1960, titled ‘Saut dans le vide’ (Leap into the Void), the French artist flies along a Parisian street just a few meters above the pavement, in a reckless attempt to patch gravity onto his boot. Klein’s extended swan dive is an apt metaphor for the world of science. Unfettered fundamental research is also a reckless leap into the void of the unknown. Whoever as a curious and contrary researcher has the guts to follow dangerous paths, and possesses the creativity to break away from the everyday, can get a long way – or nowhere. The obsession, stubbornness and perseverance needed to reach the summit are the same throughout the ages and across the disciplines. Fundamental research extends the limits of our knowledge. People want to know, are curious about how the world works. Just as mountaineers have to climb Mount Everest just because the mountain exists, top researchers cannot but attack the big questions in their field. That is not without risk. Such research can often give rise to frustration, the setbacks just keep on accumulating and it can become deadlocked. Then again it is exciting and challenging, if it gains momentum then euphoria dominates. And research always proceeds differently to what was first imagined, the promising approach turns out to be a dead end, and breakthroughs come in areas that the researcher had never anticipated. Science is people work. Researchers want to lay bare the foundations, unveil the mystery, be the first, go beyond where everyone else has been. The obsession, stubbornness and perseverance needed to reach the summit are the same throughout the ages and across the disciplines. Cold Pioneer, Heike Kamerlingh Onnes, is no different in this respect to the astronomer Ewine van Dishoeck or cognitive neuroscientist Peter Hagoort. In respect of the need for integrity, transparency and responsible action, there is little difference between them. Whether he or she is part of the Republic of Arts or operates amongst digital networks, the scientific researcher is in the vanguard. Confusion will, by definition, prevail but that creates opportunities. Whoever has talent and fighting spirit – and a dose of good luck – breaks through into new worlds and can feast his or her eyes on wonders. Fundamental research provides better understanding of the world and sooner or later leads to economic gain. Science works. Fundamental research makes us wiser. The motivation is an irrepressible curiosity about how the world functions. To understand is what it’s all about. Practical applications are welcome, but to the researcher in question they are a side issue. That wasn’t what it was all about. For society, which funds research in many cases, it is a different matter. But that’s not essential. Society knows it is assured of a double benefit: fundamental research provides better understanding of the world and sooner or later leads to economic gain. This is true for ‘learning’ in the broadest sense which is more than ‘science’. Besides the natural sciences (including mathematics) and the biomedical sciences there are the humanities and social sciences. When Professor of Comparative Linguistics, Alexander Lubotsky, with the support of publisher Brill, compiled an Indo-European etymological dictionary from the proto-language that has yielded Dutch, it was fundamental research. Lubotsky discovered that the Dutch words for ‘canal’ and ‘well’, as well as other words to do with water management, belong to proto-words that can only be reconstructed from Sanskrit and Persian: a result that informs us about the route that the Indo-European peoples in the fourth millennium BC followed on their trek from the Southern Russian steppes, their ‘Urheimat’. Will the progress in knowledge mean an end to the big questions? Or take pedagogue Rien van IJzendoorn. He is interested in “attachment”, the irrepressible tendency of every child in times of anxiety, tension, hunger or sadness to seek proximity to a protective adult. Children trust that if the worst comes to the worst, standing next to an adult will ensure that everything will work out OK. That may be father or mother, but children can also attach themselves to a leader in the crèche or a grandparent. Through structured observations of children in his experimental laboratory, equipped with cameras and sensors for heart rate, breathing and other physiological parameters, van IJzendoorn came to informed conclusions. His fundamental research has lead to strictly methodologically sound advice that can benefit the practice of bringing up children. This is of course enormously useful: children are vulnerable material. Fundamental research comes in many different forms. Let a hundred flowers bloom! But if we keep making such progress, won’t this mean an end to the big questions? Once they are solved, won’t the end of science be in sight? These questions are not new. At the end of the nineteenth century many physicists thought that the end of their subject had almost been reached and what little remained amounted to no more than the joyless measurement of extra digits after the decimal point from the numerical values of physical constants. As dead as a doornail. William Thomson (Lord Kelvin) spoke in Edinburgh of just two remaining clouds in the physicists’ clear blue sky. The Scot felt only hopelessness. But around the turn of the century Kelvin’s clouds proved to be the harbingers of two radically new, highly successful theories: quantum theory, valid in the world of the absolute smallest, and Einstein’s theory of relativity with his equally revolutionary view of space and time. Incidentally, the reconciliation of these two giants of modern physics is one of the big questions that remain open. Whoever still insists that we are finished with science: then take the question of the composition of the universe. Astronomy tells us that “normal” matter, from which the stars, planets and people are made, only covers a few percent of the stuff of the universe. The rest is ‘dark matter’, and we do not know what that is, and ‘dark energy’, which is the cause of the accelerated expansion of the universe and we haven’t got the faintest idea what it represents. In other words: we have no clue as to the vast majority of the universe! Who still dares to assert that science is finished is simply not right in the head. Thus fundamental science can keep going for the foreseeable future. In fact, it cannot stop. “The main result of knowledge is ignorance”, is a favourite saying of the American theoretical physicist and Nobel laureate (2004), David Gross. “The more we know, the more we realise what we do not know, and the more questions we can raise. Asking the right questions is half the battle, if not more”. We have no clue as to the vast majority of the universe! The latter is indeed the key. “I go over bare rocks” says Hendrik Lenstra, Professor of Number Theory at the University of Leiden. “I only work on problems where I can glimpse an opening, something I can just get my crowbar into and then crack open. Ignorance is what provides the mathematical depth. You have an intuitive feeling, a momentary Platonic glimpse of a solution and you have to uncover it. Just as a poet has to write poems, the mathematician must do maths. He cannot not do so. Otherwise he is bereft. Number theory was once the example of pure mathematics without any use. In his “A Mathematician’s Apology” from 1940 the eccentric British mathematician G.H. Hardy announced that he would turn in his grave if his favorite number theory ever found application. If only he knew! Three quarters of a century after his death, number theory is everywhere. With its prime numbers (numbers that are only divisible by 1 and by themselves, such as 7, 23 or 387,096,133) number theory is the beating heart of modern cryptography. Sending encrypted messages, encrypting military secrets, electronic banking – they are all based on number theory. Lenstra, a leading fundamental researcher (his brother Arjen advised Citibank in New York on cryptography), views the shift with mixed feelings. “Some people think it’s wonderful that all these cryptographic applications generate money,” he says. “But personally I prefer it if a new number theory then kills off those applications. During lectures I like to play the bad guy. ‘Guys’, I say, ‘Here is a great opportunity. You can restore our number theory to her former glory if you can find a way to also dissolve even the largest primes efficiently into prime factors. Then we’d finally get rid of those banks again: just us, free from the pigs rooting in our rose garden”. Are fundamental research and practical applications necessarily at odds with each other? When fundamental researchers show a complete lack of interest in the ‘exploitation’ of their results everyone misses out. G.H. Hardy is really an exception. Practical applications are definitely welcome: they increase the likelihood that the fundamental research which underlies them will gain more traction. But why should fundamental researchers themselves have to find practical uses? To suggest this implies that we’re dealing with a bunch of geeks who urgently need to get outside more and back in touch with the real world. Fundamental researchers’ time is better spent otherwise. Indeed: on fundamental research. Meanwhile, they are creating the compost on which research can flourish into applications. Applied research is only effective if it can draw on a fertile, rich soil. This compost is essential. Applied research is only effective if it can draw on a fertile, rich soil. The current trend where applied research is benefitting at the expense of fundamental research is counterproductive. It is slaughtering the goose that lays the golden eggs. There is a popular misconception that practical applications of fundamental research can be developed in the laboratory – whereas actually they normally come out of the blue. It is fine as a society to set priorities in the field of applied research and to allow economic motives to play a role in deciding those priorities. There is nothing wrong with focus. Agriculture, renewable energy, creative industries, healthy living and another five sectors – they all deserve to get additional funds under the prioritised sectors policy. But do be careful when it comes to independent fundamental research, particularly in areas falling outside the prioritised sector scope. Speaking of utility: in the long run, and sometimes very quickly, society benefits enormously from the numerous results delivered by fundamental research. There are many examples of this. Exenatide, a hormone that was discovered in 1992 in the saliva of an American giant lizard, it turns out, has a regulatory effect on blood sugar in a synthetic variant. Computers and other electronics owe their existence to pioneering work carried out in 1947 in the research laboratory of the American Bell Labs. Genetic modification is unimaginable without the discovery in 1953, by DNA researchers Watson and Crick, of the double helix. We download our favourite music on our iPod via iTunes thanks to the development of the World Wide Web at CERN, the particle accelerator in Geneva where the Higgs particle has been discovered. A list of achievements that can be expanded at will. Between fundamental and applied research the most diverse, unpredictable, bizarre and unexpected relationships exist. Between fundamental and applied research the most diverse, unpredictable, bizarre and unexpected relationships exist. It is indeed a sad misconception that these are opposites. Fundamental and applied research can coincide seamlessly into one project and in the same person. A wonderful example is Christiaan Huygen’s pendulum clock. During the Golden Age Huygens, one of the greatest geniuses the Netherlands has ever produced, performed groundbreaking research into the propagation of light, introduced the 31-tone system in the music, deduced the formula for the centrifugal force in a circular motion, and much more. At the same time he was an avid tinkerer who polished lenses on his self-designed lens grinder for his telescopes and microscopes, designed instruments (depth gauges, air pumps), made inventions (coaches and carriages) and was always looking for technical improvements. The pendulum clock of 1659 saw Huygens applying his own mathematical discovery from a year earlier. He had received responses from Blaise Pascal to a number of questions he had raised about the cycloid. That is the geometrical figure that describes the valve cap on a moving bicycle wheel. It was totally unexpected that the cycloid popped up again when Huygens was developing a precision pendulum clock – a requirement for navigation at sea. In an ordinary pendulum clock pendulum time will vary slightly depending on the size of the deflection. That (cumulative) problem was remedied by preventing the pendulum from describing an arc and instead introducing a cycloid. And you could do that by attaching two cycloid-shaped loops (cheeks) to the suspension point of the pendulum, with which the cord periodically makes contact whilst swinging back and forth. A brilliant application of fundamental mathematics and an unexpected encounter between a geometric curve and a timepiece. Huygens’ pendulum clock shows that applied research also requires great creativity and depth. Sometimes practical applications of fundamental discoveries only become apparent much, much later. In 1911 Kamerlingh Onnes discovered ‘superconductivity’: electrical power that no longer encounters any resistance at very low temperatures and therefore does not generate heat. Nobody was looking for this; no one understood what was going on. It took until 1957 before there was a theoretical explanation and only in the early sixties did superconducting metal alloys present themselves and then stimulated physicists to identify useful applications. Such as the MRI scanner, which allows us to see in detail into the body and, for example, to track and locate brain activity such as speech in the brain in real time. All thanks to the man of absolute zero. It is often the case that cancer inhibitors are actually discovered during research which was not actually focused on this. The search to find a cure for cancer is being carried out worldwide but it is often the case that cancer inhibitors are actually discovered during research which was not actually focused on this. A striking example is cisplatin. This substance was accidentally discovered in the sixties during research into the influence of electric fields on bacteria. The researcher noticed that in certain situations the bacteria divided abnormally. The culprits were found to be platinum electrodes. Further investigation showed that platinum blocked some cellular functions and in both animals and humans specifically it could have an inhibitory effect on tumors. Half a century later, cisplatin is a proven drug against testicular cancer, bladder cancer and ovarian cancer. Finally, two examples from astronomy, a discipline in which the Netherlands is seen to excel internationally but which the general public (and policy makers) do not necessarily recognise as having practical applications. In the early nineties the Australian electrical engineer John O’Sullivan scanned the heavens for radio waves originating from exploding black holes. By preventing interference from radio waves that rebounded against nearby buildings he developed (and patented) a filter technique which now forms an indispensable part of Wi-Fi networks. And in Boston, astronomer Michelle Borkin uses the same data processing techniques on images of star clusters such as Eagle Nebula M16, as when she supervises CT scans of the human heart. As a result, the amount of correctly diagnosed heart diseases via CT scans increased from 37 percent to 91 percent. Astronomical medicine as a groundbreaking application.